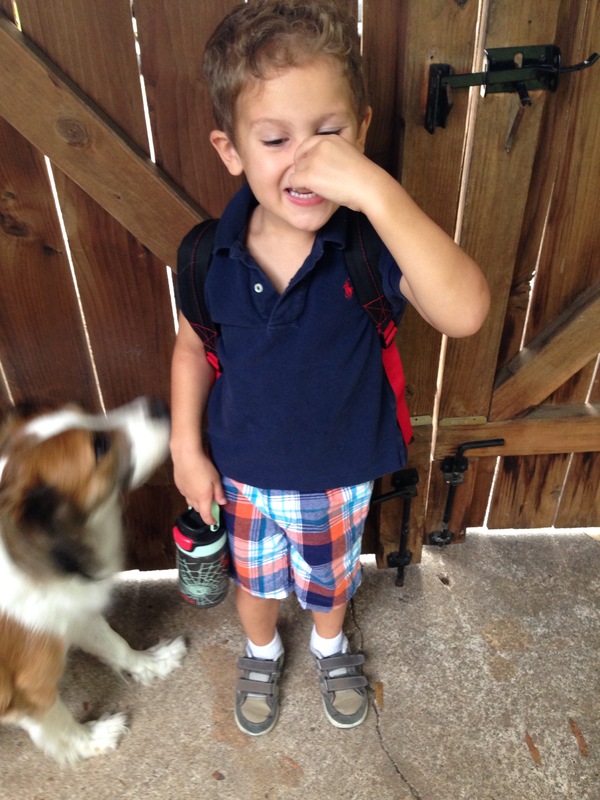 Tomorrow he leaves for preschool – two years ago tomorrow he came. Little man’s school starts tomorrow after being home all summer with me. This past few months is actually the first time he has NOT been in school at least a couple days a week. Early days I was still working (out-of-home), and then he just really liked the structure (so did I, let’s be real). It hasn’t taken long to get used to allllllll the together time and to be just a smidge bummed about the mornings alone at home, coming up. On Cary’s birthday in early August we reached the halfway point – half of his life without us, half of his life with us. Took a while to get there. I thought I’d post something then but nothing particularly came out. I thought of plenty to say to him. Not much for the rest of you. Boom boom boom, all just about a month from each other – the Halfway Point, the 2-Year-Anniversary, and dude’s 4th Birthday coming up in a few weeks. He is literally like no one else. He is infuriating and thrilling and fierce and brilliant. There is actually no other kid like him. Except every other kid on this here little planet. But here is the thing about my boy, my forever boy, my threenager-man-baby, my battle-hardened warrior – he is KNOWN. I am not kidding you that I find him eleventy times more fascinating and exciting and valuable than any other kid in the entire world. He IS more fascinating and exciting than any other kid in the entire world. To me, and to his Daddy. Because that is every child’s right. Not a one is more valuable or important than another. But every single one deserves to be THE WORLD – to their parent(s). I have screwed up so much in two years I can’t even believe I have the audacity to do this again. Sometimes I wonder what the **** I’m even doing. I wish I could say, and that he would understand at his tender young age, that I am SORRY for all the things I have misunderstood, I am SORRY for the wrecked state he found me in, I am SORRY for all the things he’s lost, for all the fights he’s had to fight and the ones he didn’t have to fight and the fact that he was a baaaaaby (for crying out loud!) and he didn’t know how to tell the difference, so he spent so long fighting everything and everyone, bless his little heart. But I know my boy. He surprises and moves me daily, I’m not kidding. I get more punch-in-the-gut moments than I ever dreamed I would (the sweet-sad, metaphorical kind [although I get my share of the literal ones too….]) where the depths of his thoughtfulness or understanding or brilliance or sweetness or bravery just blindside me. I will never, ever know all there is to know about this boy, but I know him deeply and richly and truly, and I also love him with a COVENANT I made that means that I will never, ever, ever go anywhere. A sticking love, a staying love, a digging-in love, a not-leaving love. Every single child deserves that. Everything (everything) else is negotiable. Do you have any idea how many kids reach “adulthood” without that? I could give you a statistic but you wouldn’t care. ANY. Any kids is too many kids. The truth of it is – there are thousands of kids waiting for families, but there are literally more churches than waiting kids in TX. Entire churches. Outnumber these kids. And still thousands wait. Church, where are we? Come on. This is our job. Again, I could give you scriptures but you have heard them before. I’m not giving you quotes and numbers for you to skim over. Go look it up if you want. It’s in there dozens of times – care for orphans, a family for the family-less. Providing is great, feeding is generally a good idea, fun times are nice, but this is your call (should you choose to accept it) – to know these kids and to stay. You don’t have to be hilarious, you don’t have to be fabulously wealthy, or have 8 Pinterest boards of sensory-rich developmental activities. Know them. And keep your promises. Every individual one of them is truly, actually infinite in their humanity – humor, talent, sweetness, hurt, insight, compassion… Each is made in the image of an infinite God and nobody else carries the same piece that they do. That’s our call – it’s not paperwork and it’s not classes and it’s not logs and it’s not even sleep schedules and packing snacks and changing diapers – it is to KNOW these children who deserve to be known the way that only parents can. That’s how it was always intended. And for those of you who think our dude is lucky – I am telling you now that for me it is a PRIVILEGE. I cannot thank God enough that this child got the opportunity to be known by his own parents, and that we get to be the ones to do it.